Haq's Musings: Jaswant Lauds Jinnah as "A Great Indian"
Jinnah was a great Indian. 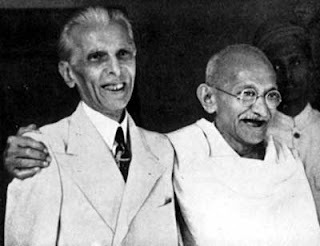 Gandhi himself called Jinnah a great Indian. Why don't we recognize that? Jinnah stood against the might of the Congress party and against the British who didn't really like him. Jinnah was not against Hindus. Indian Muslims are treated as aliens. Nehru's insistence on centralized system led to India's partition. Senior BJP leader Jaswant Singh has said Pakistan's founder Mohammad Ali Jinnah was "demonized" by India even though it was Jawaharlal Nehru whose belief in a centralized system had led to the Partition. Jaswant, whose book "Jinnah - India, Partition, Independence", will is being released today, also said Indian Muslims are treated as aliens. "Oh yes, because he created something out of nothing and single-handedly he stood against the might of the Congress party and against the British who didn't really like him...Gandhi himself called Jinnah a great Indian. Why don't we recognize that? Why don't we see (and try to understand) why he called him that," Singh said, when asked by Karan Thapar in an interview whether he viewed Jinnah as a great man. He said he did not subscribe to the popular "demonization" of Jinnah. Singh, a former external affairs minister, feels India had misunderstood Jinnah and made a demon out of him. Contrary to popular perception, Singh feels it was not Jinnah but Nehru's "highly centralized polity" that led to the Partition of India. Asked if he was concerned that Nehru's heirs and the Congress party would be critical of the responsibility he was attributing to Nehru for Partition, Singh said, "I am not blaming anybody. I am not assigning blame. I am simply recalling what I have found as the development of issues and events of that period." Singh contested the popular Indian view that Jinnah was the villain of Partition or the man principally responsible for it. Maintaining that this view was wrong, he said, "It is. It is not borne out of the facts...we need to correct it." He feels Jinnah's call for Pakistan was "a negotiating tactic" to obtain "space" for Muslims "in a reassuring system" where they would not be dominated by the Hindu majority. He said if the final decisions had been taken by Mahatma Gandhi, Rajaji or Maulana Azad -- rather than Nehru -- a united India would have been attained, he said, "Yes, I believe so. We could have (attained an united India)." Singh said the widespread opinion that Jinnah was against Hindus is mistaken. When told that his views on Jinnah may not be to the liking of his party, he replied, "I did not write this book as a BJP parliamentarian. I wrote this book as an Indian...this is not a party document. My party knows I have been working on this." Singh also spoke about Indian Muslims who, he said, "have paid the price of Partition". In a particularly outspoken answer, he said India treats them as "aliens". "Look into the eyes of the Muslims who live in India and if you truly see the pain with which they live, to which land do they belong? We treat them as aliens...without doubt Muslims have paid the price of Partition. They could have been significantly stronger in a united India...of course Pakistan and Bangladesh won't like what I am saying. In his book, Singh says Pakistan's "induced" sense of hostility to New Delhi is now somewhat "mellowed" and it is ready to accept a greater understanding of the many oneness that bond it with India. However, he admits Pakistan had chosen terror as an instrument of state policy to be used as a tool of oppression. "...nemesis had to visit upon such policy planks; that malevolent energy of terror, by whatever name you choose to call it, once unleashed had to turn back upon its creator and to begin devouring it," Singh writes in "Jinnah - India, Partition, Independence", which will hit the stands tomorrow. "This has now converted Pakistan into the epicenter of global terrorism, sadly, therefore, Talibanization now eats into the very vitals of Pakistan," the 669-page book says. "Its (Pakistan's) induced and perpetual sense of hostility to India is now somewhat mellowed, it is more confident of itself, therefore, accommodative and is now ready to accept a greater understanding of the many oneness and unities that bond India and Pakistan together. Or is it really ready? Dare I ask?" Singh questions. The BJP, however, maintains that Pakistan has been responsible for terrorist acts against India by elements trained and funded from its soil. jaswant will go the way of advani. This stupid move of advani to show himself as a great secularist to attract muslim votes bombed on the both the side. Neither muslim believed him nor hindus voted for him. Hope people learn lesson from these two great diplomatic leaders. Anon: "jaswant will go the way of advani." You may be right. But I think it could possibly help BJP by taking away the power and the mystique of Nehru family which sustains Congress in power. If Indians begin to believe Jaswant's claim that the true culprit of partition was Nehru (not Jinnah), then it will take votes away from Congress and help BJP. The old man - Jaswant Singh - has raked up another controversy before selling his book. Jaswant's views on Jinnah will be a fodder for debates and discussions. Period! I doubt the BJP can get political mileage out of it. The electorate does not decide one party over the other based on the disagreements between ex-national leaders who are long gone. Anon: "The electorate does not decide one party over the other based on the disagreements between ex-national leaders who are long gone." In a rural, agrarian society with high illiteracy, national icons are important...such as Nehru/Gandhi in India and Jinnah/Bhutto in Pakistan and Mujib in Bangladesh. Dynastic politics and dynastic rule are hallmarks of the South Asian politics. Riaz, you wrote, "Dynastic politics and dynastic rule are hallmarks of the South Asian politics." Like in South Asia, dynastic rule or single party rule is witnessed in other parts of the world such as Japan and Mexico. Besides, icons change over time and elections in India revolve around contemporary issues. If political parties drumbeat issues that do not affect the lives of electorate they're usually hammered in post-election results. That makes me believe Jaswant's book will not help the BJP during election time. In some ways, Jaswant Singh shares the frustration that Jinnah may've felt in overpowering the Congress party of their eras. I am from India. I don't think Jaswant Singh has is talking or writing lies in his books. whatever he has found he has written. we were always told how Jinnah was now alteast we would come to know the other side of the story. Jaswant Singh is not a fool to write anything. Yes, maybe. But standards in India are far higher even for the dynasties than they are in Pakistan. Comes from almost uninterrupted electoral politics. The so-called "illiterate folks in the countryside" - code for rural folks in the North Indian states (rural folks in South India are largely educated) are still well-schooled in the power of the ballot. As a result, Rahul Gandhi, Sachin Pilot and a host of other generational politicians are far more in touch with what the people are looking for than that little moron Bilawal. That dude is only outperformed by his "hugging" father (remember the Palin episode?). We wanted d demon, we created in India out of Jinnah. Who can forget his clarion call for Homerule, when partition was not even thought of? If one goes through pages of history, Jinnah always talked about United Free India. The contemporary circumstances and fellow congressmen (read Nehru) made him to quit Congress and form Muslim league. If any Indian who follows Marathi and reading this blog, I highly recommend Jinnah's biography written in Marathi by Anand Hardikar. (Titled "Quaid-e-Azam)This book will certianly unviel a new Jinnah unknown to us Indians. Just now I read that Jaswant has been expelled from BJP for his views on Jinnah......man... we live in democracy!!!! and you cannot express your views. I know that almost all Indian would think that I am a Muslim writing in a guise of Hindu name...I dont pay damn to them. I only wish that Jinnah should have live atleast 10 years more after 1947. ... to the original question, why did Mr Singh write this book? Does it have to do with his wider political ambitions? He is a self professed liberal in a party of hawks. In 1992, at the zenith of the BJP's rathyatra (motorised chariot) movement to whip up support for a temple at Ayodhya, Mr Singh did not attend a single function on the road. His induction into the cabinet in the late 1990s was vetoed once by the party's ideological fountainhead, Rashtriya Swayamsevak Sangh (RSS). With his mentor and BJP's only pan-Indian leader and former prime minister Atal Behari Vajpayee fading out and Mr Advani himself weakened by political defeat and party infighting, is Mr Singh trying to position himself as a liberal party leader-paterfamilias that Mr Vajpayee once occupied? It is difficult to say. "Mr Singh trying to position himself as a liberal party leader-paterfamilias that Mr Vajpayee once occupied? It is difficult to say"
Too late for him anyway..BJP took great pride in being a cadre party and being able to distinguish itself from quarrelsome Congress. But not being able to get hold on power for 2 terms and utterly confused ideologically after Vajpayee's retirement, BJP find itself in the position as Congress, only weaker and more divisive. This also shows that majority of Indian voters who are rural Hindus are not particularly charmed by Hindu fundamentalism. Their richer urban cousins, especially those who live in USA and are Modi fans could learn from this. The real strength for India and Indians has always been democracy and strong political base. No one of Indians do believe Nehru is great. We arevery aware of Nehru familys abilities and false glorifications. But that does not put Jinnah at par with Nehru any day. Nehrus internal strength is many times mightier than Jinnah. His internal discipline and self discipline are what we Indians have benefitted from. Indira is deadlier to Pakistan than any of BJP leaders were. The most successful achievement of Congress is to divert Indian muslims attention from their backward cousins across border and create Indian consciousness. My fathers generation is poles from my generation.BJP is confused today and will never create History with its confused policies. India is far too preoccupied economically that Indian system will ignore this book quickly as it does not fit into its system. Power rules. Pakistan with its self destructive policies and ridiculous leaders looks as confused it ever was. Look at any Pakistan in any forum-they have no idea what a nation or nationhood means . The only thing they are aware is that they are muslims. Its is increasingly hard to accept unity for Indians than Pakistanis. why and who wants a 15 million misguided rural population with extreme religious views. No wonder Jaswant is popular in Pakistan. Mumbai attacks are land mark because for the first time Pakistan is hated deeply by Indian common man apart from hindu nationalists.This is coming from an common man like me from the streets of Kolkata. This will make things very hard for Pakistan and its extremely foolish to think that Indians will come to table for talks even at US pressure.If Manmohan cannot do it-No one can attempt it.Its unfortunate that Pakistan is known for its terrrism policies and terrorists when its generation should be rapidly climbing the ecomomic growth ladders. Inspite of having much less poverty than India, its growth is no where near India because of its intolerant society. The sad part is it cannot just rise quickly because foundations were never sincerely laid for a stable nation by reforms such as land, political or electoral. Now to climb fast economically will be tragedy as it will collapse fast. What a mess and what a tragedy. The news of the sudden death of Mr. Jinnah will be received with widespread regret in this country. Till barely a twelvemonth ago he was, next to Gandhiji, the most powerful leader in undivided India. And not only among his fellow-Muslims but among members of all communities there was great admiration for his sterling personal qualities even while the goal which he pursued with increasing fanaticism was deplored. For more than half the period of nearly forty years in which he was a towering figure in our public life he identified himself so completely with the struggle that the Indian National Congress carried on for freedom that he came to be as nearly a popular idol as it was possible for a man so aristocratic and aloof by temperament to be. During the last years of his life, as the architect of Pakistan, he achieved a unique authority in his own community by virtue of the blind allegiance which the mass, dazzled by his political triumphs, gave him though the sane and sober elements of the community became more and more doubtful of the wisdom of his policies. Here is a piece by Luv Puri, a Fulbright fellow at New York University. He previously reported for The Hindu in Jammu. It was published in Pakistan's Dawn newspaper today. Paying tributes to Jinnah in Karachi, Advani described him as among the ‘very few who actually create history. Qaid-e-Azam is one such rare individual.’ Advani also referred to Jinnah’s August 11, 1947 speech, in which he made a forceful espousal of Pakistan as a secular state. As such, Advani’s statement caused a political storm within the BJP. In the Indian imagination, particularly that of the BJP, Jinnah is held responsible for the Partition of India and the ensuing communal riots. Millions of Indians imbibe this notion in their early life through school and college history books. In this context, Advani had to pay the price for his reconciliatory remarks on Jinnah. He had to resign from the party president’s post. The ongoing controversy continues to haunt him, and even resurfaced during the 2009 parliamentary elections. Jaswant Singh, in his newly released book, Jinnah - India, Partition, and Independence, goes a step further than Advani. He is the first Indian lawmaker to publicly challenge Jinnah’s vilification and question the claim that he was singlehandedly responsible for Partition. Singh apportions much of the blame for Partition on Jawaharlal Nehru and Sardar Patel. Not surprisingly, the action against Singh was swift and decisive as compared to Advani. He was expelled from the party without any notice. The reason for this drastic decision was the much bigger challenge that Singh, a self-proclaimed liberal democrat, posed to the BJP and its ideological moorings: he attacked Patel, the party’s pivotal icon in the freedom struggle. It is notable that the BJP is indifferent to Jaswant Singh's criticism of Nehru, who it finds guilty of several other ‘wrongdoings,’ including internationalising Kashmir. On Patel, however, the BJP remains hyper-sensitive to any criticism. He is described as the Iron Man of India, credited for the amalgamation of hundreds of princely states with the Indian union. Indeed, Patel didn’t hide his majoritarian streak of politics. He had serious political differences with his colleagues. He belonged to Gujarat, a state ruled by BJP’s Chief Minister Narendra Modi, who is alleged to be complicit in an anti-Muslim pogrom in 2002. (Keeping with character, Modi took no time in banning Singh’s book and termed it as an insult to Gujarat.) Incidentally, the most revered personalities in Pakistan and India, Jinnah and Mohan Das Karam Chand Gandhi, both hailed from Gujarat as well. By dismissing Singh, the BJP is sending a message that it will not tolerate any critical examination of national icons and question its negative portrayal of Jinnah. The BJP fears that this will impact its reputation as a nationalist political outfit. But the party calculations seem to be out of sync with empirical reality as it underestimates the maturity of the Indian masses. After all, the BJP’s over-simplistic and negative political campaign caused the second consecutive defeat of the party in the 2009 parliamentary elections. The exposure of many Indians to the wide array of work done on Partition through various sources, including the internet and foreign scholarship, strengthens the process of revisiting political history with an open mind. The understanding of historical and social factors that resulted in Partition and the personalities that ushered in a new era is being shaped with the revelation of new facts. To view the national icons of India and Pakistan in black or white will defeat the pursuit of objective research. There is enough scholarly material on Partition, mostly published by foreign authors, which discusses the social and historical forces that influenced politics and politicians. It is regrettable if we deny the intellectual and academic space to our own researchers to find objective explanations to past events. A grand reconciliation in the history writing of both countries is only possible in an environment free of fear and demagogy. The caricature of Jinnah cannot be painted in black or white, good or bad. In fact, Ayesha Jalal, a Pakistani historian at Tufts University, has gone to an extent of calling the creation of Pakistan a mistake and Jinnah a great lawyer with feet of clay. Jaswant Singh, like Ayesha Jalal, in his book does not exonerate Jinnah for his actions; he is spreading the responsibility of partition across all protagonists of the day. Simple as that! "At his bitterest he never forgot that firm friendship between India and Pakistan was indispensable"
I wish pakistan all the best but it should find its own path and a path that has no simlilarity with India and path guided by its founders vision. Everyone knows the path Pakistan is on today and that is no where near that vision. Infacts it is the very reason why Pakistanis are having tough time today. I would say Pakistan needs to learn to walk first and then try to run. After 60 years, it is still crawling. It should forget confrontation with Indians and start path of reconstruction with its fellow islamic nations and USA. Its very very ridiculous for Pakistanis to seek very close relationship with India after partition as it makes no sense. India will not like to have that nor does Pakistan. The moment you try to do that the identity of Pakistan will perish with any doubt or prejudices here. Lets not take it there. The idea of an Indian is very different from Pakistan ideology and will not be accepted. The root issue is democracies will shun religious societies not because of hatred but because of lack of respect and trust. But I do believe that once Pakistan sets its path right with right attitude and has the will to keep religion outside its affairs, there will be no stopping for its rise and its rise will be quicker than Indias. I'm not sure why there is so much soul searching about Partition! Who cares who instigated it? The only thing that matters is that it was a roaring success for India and a complete disaster for Pakistan and Bangladesh! About one-third of the world's extremely poor people live in India. More than 450 million Indians exist on less than $1.25 a day, according to the World Bank. It also has a higher proportion of its population living on less than $2 per day than even sub-Saharan Africa. India has about 42% of the population living below the new international poverty line of $1.25 per day. The number of Indian poor also constitute 33% of the global poor, which is pegged at 1.4 billion people, according to a Times of India news report. More than 6 million of those desperately poor Indians live in Mumbai alone, representing about half the residents of the nation's financial capital. They live in super-sized slums and improvised housing juxtaposed with the shining new skyscrapers that symbolize India's resurgence. According to the World Bank and the UN Development Program (UNDP), 22% of Pakistan's population is classified as poor. One point that is often overlooked is that till 1937 Jinnah did not use religious sentiments in order to gain political mileage. Nonetheless, the Congress had used Hindu symbols to arouse the sentiments of Hindus from the very beginning. It was when Nehru refused to acknowledge the Hindu-Muslim question that Jinnah responded with a powerful speech at the Muslim League session in October 1937. Mahatma Gandhi called that speech a “declaration of war”, but Jinnah said “it was made in self-defence”. Jinnah’s speech indicated that all means of persuasion had been exhausted yet the Congress was not willing to address “real issues”. Thus, Jinnah was forced to voice the demand for Pakistan. When Jinnah was leaving India on August 7, 1947, he appealed to Hindus and Muslims to “bury the past” and wished India success and prosperity. But Sardar Vallabhbhai Patel said, “The poison has been removed from the body of India.” Patel overlooked the fact that Jinnah was not the poison, and that it was Patel’s pro-Hindu sentiments which poisoned Indian polity. The BJP cannot dilute historical facts. Veer Savarkar formulated his ‘two-nation theory’, whereas the Muslim League demanded Pakistan only in 1940. Jinnah struggled for a united India for 17 years after Savarkar mooted the idea of two separate nations. The Hindu Mahasabha also passed a resolution in favour of the concept of two nations in 1937, much before Jinnah demanded Pakistan in 1940. There is no iota of doubt that Hindu revivalist organisations contributed to the partition of India. There were some other players too. Little attention has been paid to the role played by powerful Hindu businessmen in the partitioning of the country. GD Birla had written: “Communal representation should go and if possible redistribution of provinces should be made. I do not know whether splitting Punjab and Bengal will be liked by the people, but I would personally welcome it” (Notes of Conversation with Malviyaji). Ayesha Jalal, in her much-acclaimed book, The Sole Spokesman, Jinnah,The Muslim League and the Demand for Pakistan, writes: “Much of Jinnah’s demand for Pakistan would seem to correspond with the idea of Birla.” Intellectuals should ponder over why Savarkar, the Hindu Mahasabha, the RSS, and Birla are treated as ‘nationalists’ and Jinnah as prophet of partition. This is because history has been turned into myths by Hindutva propagandists. Whatever Mr Jaswant Singh has written in his book is based on facts. Even HM Seervai wrote: “Such an account cannot rest content with the popular view in India that the partition of India was brought about by the disappointment, ambition, the vanity and the intransigence of one man, Mohammed Ali Jinnah. This view receives no support from the materials now available to students of history.” (Legend and Reality). One of Pakistan's most acclaimed historians, Ayesha Jalal bemoans the fact that history as an academic discipline has failed to grow in her country, a deficiency that needs to be addressed to spawn a new breed of scholars in the subject. A professor of History at the Tufts University with as many as seven books to her credit, the Pakistani-American who is an authority on South Asia has chosen to return to Pakistan as a visiting scholar to help address the gap in her own way. In India to attend the Jaipur Literature Festival, Jalal told PTI during an interaction why she felt that the academic growth of history in India had contributed to the development of a worthy scholarship in this country. "Of course, there are biases and political agendas too, but India has continued to teach history, as a result of which you have historical scholarship coming from India," she said. "I was bemoaning the fact that in Pakistan history has suffered as an academic discipline, and is not taught as is the way in India," she said. Jalal's books include 'The Sole Spokesman' and 'Democracy and Authoritarianism in South Asia' ?" works that have tried to trace the history of the subcontinent including the origins and the tortured legacy of the partition. She has also co-authored Modern South Asia: History, Culture and Political Economy with her husband Sugata Bose, a book that is considered perhaps the first joint exercise by an Indian and a Pakistani in dissecting the history of modern South Asia. A grand niece of eminent Urdu writer Saadat Hasan Manto, Jalal returns to Pakistan from her base in the United States as a visiting professor at the Lahore University of Management Sciences (LUMS). "In my own modest way, I am trying to address this issue by teaching history in Pakistan," she said. The author, whose last book 'Partisans of Allah: Jihad in South Asia' traced the discourse on jihad in South Asia over centuries, strongly believes that the Taliban has lost support among the people and that Pakistan is a country that is politically more resilient than many would believe. "The Arab Spring has reinforced the fact that the people are prepared to take up structures of state. In Pakistan, despite military regimes, no ruler has survived more than 11 years, forget about 30 or 40 years. I think Pakistan is politically more resilient than many people believe, all it needs is a chance," she said. However, she believes the issues ? "- of pervading injustice and inequity -- that have contributed to al qaeda'a rise will have to be addressed to put an end to violence. The emergence of Imran Khan on Pakistan's political horizon has made many people take note of the former cricketer's potential, and Jalal feels it has a lot to do with the prevailing disenchantment and yearning for a change. "There is a lot of disenchantment in Pakistan, there is anti-incumbency what Indians know very well. Imran Khan's popularity has much to do with it. People are looking up to him for a change," she says. thank god for partition if you combine the population of India PAkistan Bangladesh Muslims are already at 40% and growing fast so a united India would be muslim majority by 2025. Thank you Jinnah!Rest in peace! While Dhulipala is not above suggesting that historians like Ayesha Jalal are disingenuous in their use of sources, if not entirely ignorant of them, his own narrative is full of such evasions. Correctly describing Ambedkar as the great theorist and critic of Pakistan, for instance, Dhulipala offers us one of his extended summaries of the Dalit leader’s book, Thoughts on Pakistan, which serves as an example of his mode of analysis. By having the text “speak for itself” he can report without comment those passages in which Ambedkar deploys the repertoire of colonial scholarship to paint Muslims as a religious and military threat to Hindus, whose exclusion from India can only be welcomed. Instead of accounting for such hyperbolic statements by locating them within Ambedkar’s political rhetoric, where they are arguably meant to frighten upper castes into turning to Dalits for support, Dhulipala merely declares them to be Ambedkar’s “own beliefs” (p. 135). How, then, are we to account for his good relations with Jinnah, whose statement, that Ambedkar wanted Dalits to replace Muslims as the favored subjects of quotas in a partitioned India, is passed over in silence? Or the support Ambedkar enjoyed from the Muslim League before and after his book was published? Dhulipala doesn’t mention this, just as he doesn’t tell us, when describing with horror the “Day of Deliverance” Jinnah declared to celebrate Congress’s resignation of government in 1939, that both Ambedkar and Savarkar joined in the festivities. In the time-tested way of old-fashioned national history, Dhulipala’s book depoliticises Muslim nationalism by making it out to be a religious phenomenon at the popular level. Of course Shahid Amin’s Event, Metaphor, Memory manages to do the same for Gandhi’s first movement of Non-Cooperation, but without suggesting that Congress and its leaders were therefore depoliticised or in thrall to Hindu “enthusiasm”. The author of Creating a New Medina separates the Muslim League from all other parties and politics in India, as indeed the world, to stand alone as the unique but still inexplicable villain of the story of partition, which has now surely become one of the most boring subjects in Indian historical writing. Having myself written a book severely critical of the idea of Pakistan, I am not caviling at Dhulipala’s political allegiances, but find his argument to be anachronistic in its subject and scope, and therefore singularly unproductive intellectually. Is the kind of history written by young scholars like Dhulipala going to be reduced to waging old wars with equally ageing analytical equipment? Or maybe it is only in the intellectually impoverished field of Pakistani history that a book like this can be published. Former Vice President Hamid Ansari said while people like to hold Pakistan or the British responsible for India's partition, no one wants to admit that India was equally responsible for it. Referring to a speech delivered by Sardar Vallabhbhai Patel's on August 11, 1947, four days before India got its independence, Ansari said in that speech, Patel had said "he took these extreme steps after great deliberation". Ansari claimed that Patel in this speech also said that "despite his previous opposition to Partition, he was convinced that to keep India united, it must be divided". He said these speeches are available in Patel's records. "But as politics of the country changed, someone had to be blamed. So Muslims became the scapegoat and were blamed for Partition," Ansari said. Meanwhile, the Bharatiya Janta Party has hit out at Ansari. BJP spokesperson Sambit Patra demanded an apology from Ansari for his comments.